EZBET Project is participating in the event “Sommerfest der Kulturen” 2018 in Stuttgart with activities for adults and kids. Don‘t forget to pass by our info-desk- 17th, 18th and 22nd of July! This festival is the largest intercultural festival in southern Germany. Information about the EZBET project will be available to everyone who will be attending the festival. The event is organized by Forum der Kulturen Stuttgart. Mini workshops and activities will be shared with kids and adults. EZBET Project is an academic initiative fully supported by the DAAD-Program. The project’s academic backbone is the department of International Urbanism at the Institute of Urban Planning and Design (SI). The novelty of the project lies in its aim to provide the basic urban and social facilities in the informal areas in Cairo through engaging three main Stakeholders in development activities: 1) multi-disciplinary students and academics, 2) EZBET residents, and 3) governmental and non-governmental organizations. EZBET focuses on three main pillars: education, health and profession as main keys for sustainable community development. 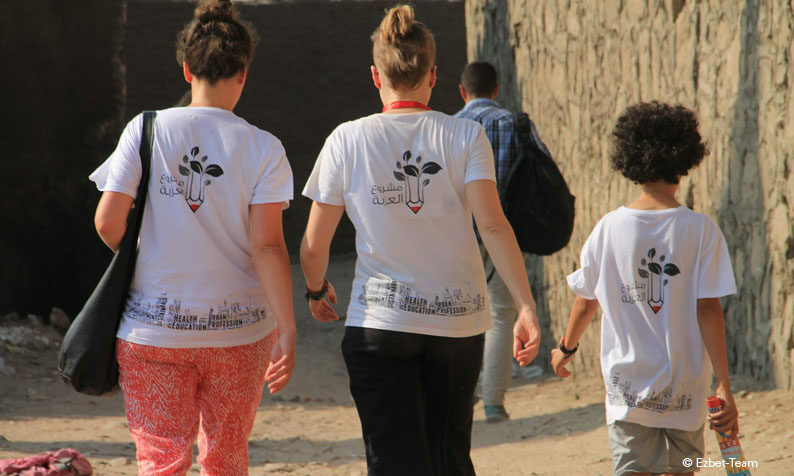 Working hand in hand with local communities, the project helps to empower local residents and students to be part of the decision-making process, upgrading their world without changing its logic, culture or identity.